Not just your average plain white rice, this Mexican-style spin boasts big flavor and texture thanks to frozen veggies and a hit of chile. 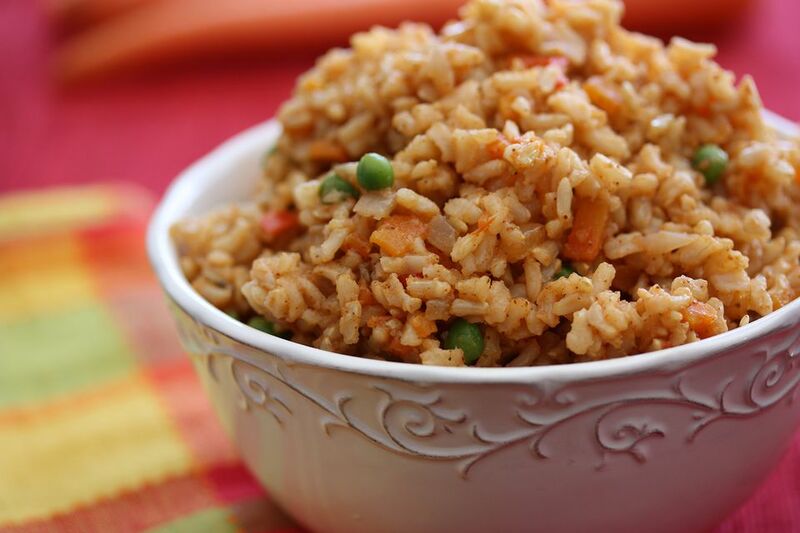 Rice is inexpensive, and easy to find so you can make this dish as often as you like. To make it a main dish, add in 1-2 cups of cooked chicken or turkey. Add the rice and water to the pot and cook uncovered for 10 minutes, then cover and reduce heat to medium-low and simmer for another 10 minutes. Check rice and simmer for an additional 5 minute if necessary. Set aside. As a rice cooks, add the cooking oil to a pan and heat on medium-high. Add the garlic, followed by the onion and chile. Cook until fragrant. If using, add peas and carrots to the pan and cook until soft, stirring occasionally. Once the vegetables are ready, add the cooked rice to the pan and mix thoroughly to combine. Add salt, adjusting seasoning if more is needed. Swap out the water for chicken broth, which provides extra flavor. If using salted broth, cut back on the salt that you add. Increase the heat level by adding more fresh chili or by sprinkling in cayenne pepper or red chili flakes to taste. For a splash of citrus flavor, squeeze fresh limes over the dish before serving. Brown rice version: Swap the white rice for its whole-grain sibling, brown rice. It takes longer to cook and needs more water, so increase the water to 6 cups and allow approximately 45 minutes. One-pan version: Instead of boiling the rice separately, saute the dry grains in 2 tablespoons of olive oil in a saute pan over medium heat for 4 to 5 minutes. Add the garlic and onion and saute for 1 to 2 minutes, and then add the water and cook the rice risotto-style, stirring regularly until the liquid is absorbed. Add the chili and vegetables as normal.